HRC Foundation released a report detailing the results of its groundbreaking nationwide survey of LGBTQ people that reveals an urgent need for inclusive employer-paid family and medical leave. It comes on the 25th anniversary of the Family and Medical Leave Act (FMLA), a federal law guaranteeing certain employees up to 12 weeks of unpaid, job-protected leave per year. 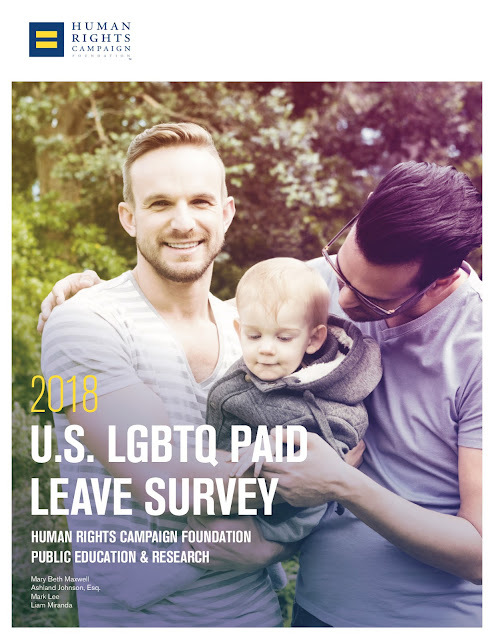 More than 5.400 LGBTQ people from all 50 states responded to HRC’s 2018 U.S. LGBTQ Paid Leave Survey, the largest and most comprehensive ever of its kind, and the results are sobering: only 45 percent of respondents reported that their employers offer leave policies - paid or unpaid - that are inclusive of LGBTQ families and identities. And, when compared to the overall U.S. population surveyed in a recent Pew Research poll, LGBTQ respondents reported heightened concerns about accessing leave, citing potential loss of income and adverse workplace outcomes from having to disclose their LGBTQ identities through leave requests. They also reported higher rates of simply foregoing needed or desired leave to avoid those significant downsides. And 48 percent of respondents, reflecting the prevalence of family rejection within the LGBTQ community, indicated that they feel an increased responsibility to care for loved ones whose own families have rejected them because of their LGBTQ identities -- a critical caretaking role often excluded from leave policies. Parents Bret and Chad were denied paid family leave.